Synthetic peptide (Human) - which represents a portion of the C-terminus of human MEN1. Our Abpromise guarantee covers the use of ab2605 in the following tested applications. ChIP Use a concentration of 1 - 4 µg/ml. WB 1/1000 - 1/10000. Detects a band of approximately 68 kDa (predicted molecular weight: 68 kDa). Essential component of a MLL/SET1 histone methyltransferase (HMT) complex, a complex that specifically methylates 'Lys-4' of histone H3 (H3K4). Functions as a transcriptional regulator. Binds to the TERT promoter and represses telomerase expression. Plays a role in TGFB1-mediated inhibition of cell-proliferation, possibly regulating SMAD3 transcriptional activity. Represses JUND-mediated transcriptional activation on AP1 sites, as well as that mediated by NFKB subunit RELA. Positively regulates HOXC8 and HOXC6 gene expression. May be involved in normal hematopoiesis through the activation of HOXA9 expression (By similarity). May be involved in DNA repair. Defects in MEN1 are the cause of familial multiple endocrine neoplasia type I (MEN1) [MIM:131100]. Autosomal dominant disorder characterized by tumors of the parathyroid glands, gastro-intestinal endocrine tissue, the anterior pituitary and other tissues. Cutaneous lesions and nervous-tissue tumors can exist. Prognosis in MEN1 patients is related to hormonal hypersecretion by tumors, such as hypergastrinemia causing severe peptic ulcer disease (Zollinger-Ellison syndrome, ZES), primary hyperparathyroidism, and acute forms of hyperinsulinemia. Defects in MEN1 are the cause of familial isolated hyperparathyroidism (FIHP) [MIM:145000]; also known as hyperparathyroidism type 1 (HRPT1). FIHP is an autosomal dominant disorder characterized by hypercalcemia, elevated parathyroid hormone (PTH) levels, and uniglandular or multiglandular parathyroid tumors. Nucleus. Concentrated in nuclear body-like structures. Relocates to the nuclear matrix upon gamma irradiation. Immunohistochemistry (Formalin/PFA-fixed paraffin-embedded sections) analysis of human breast carcinoma tissue labelling Menin with ab2605 at 1/1000 (1µg/ml). Detection: DAB. Detection of menin in 293 cells using ab2605 (2ug/ml). 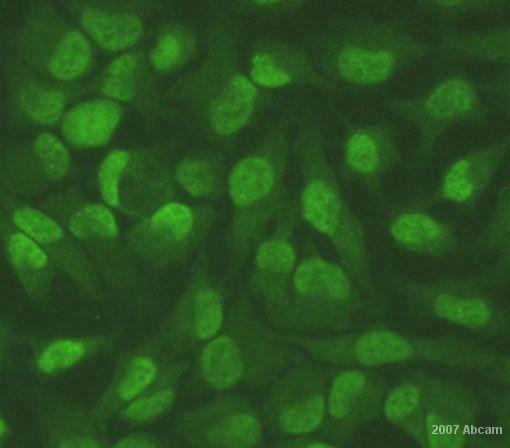 Secondary antibody is Cy3 conjugated anti rabbit IgG. Ab2605 staining Human normal placenta. Staining is localized to the nucleus. Publishing research using ab2605? Please let us know so that we can cite the reference in this datasheet. I also asked the positive primers specific to menin ChIP. I think this will be more helpful if you can give to positive primers to menin ChIP instead of general list of primers. Thanks for the generous offer. It was for two antibodies including two vials of Ab21873. Note that the order dates from 28/9/2010 and as I pointed out in my previous E-mail, we did receive replacements with an older batch. All I can say is that if lot number GR21097-1 works for chromatin immunoprecipitation, we will be happy to pay for it. I have issued a free of charge replacement with the order number 1042072. Please note that typically our Abpromise guarantee holds for 6 months from when you receive the antibody,although I have made an exception in this case.Should you still be experiencing difficulties, or if you have any further questions, please do not hesitate to let us know. Thank you for the offer of a replacement vial. However, I suspect that the previous "complaint" you refer to came from us and Abcam kindly replaced the antibody with an earlier batch. I don't think we should expect more. My question, which was simply prompted by an E-mail from Abcam, was whether there is now a more recent batch of ab21873 (presumably lot GR21097-1) and if so, would it be possible for us to test an aliquot in ChIP conditions before buying several vials. If you would like to go ahead with the replacement offer, please just provide me with the PO number or Abcam order reference number associated with the purchase of ab21873, lot 937205 so I can process the replacement. Thank you for your enquiry. I am sorry to hear of the trouble you are having with lot 937205 in ChIP. I looked in our records and there was one other complaint of a similar nature regarding ChIP with this lot of ab21873. We do have a new lot in stock now (lot GR21097-1) and I am happy to offer a replacement for the faulty vial of ab21873. Please pass along the PO number or Abcam order reference number associated with the purchase of ab21873, lot 937205 so I can process the replacement. Phone call requesting information regarding the region recognised by Anti-Menin antibody ab2605. I have looked into whether the anti-Menin antibody (ab2605)would be suitable for the experiments you are hoping to perform. Unfortunately, the immunogen used to raise this antibody is directed against the C-terminal end of human Menin. Through epitope mapping it has been established that the antibody specifically recognises a region betweenresidue 575 and theC-terminus (residue 615) of Menin. This antibody would therefore not be suitable if you are hoping todetect the regionN-terminal of residue 575. I have however been able to find two other antibodies which we have been raised against peptidesderived from the N-terminal sequence of Menin which may be suitable for you.Ab32963 and ab75923 are both rabbit polyclonals which have been used in Western blotting.A blocking peptide is also available for ab32963, the catalogue code for this is ab32962. I hope this information has been of help. If you require any further information please do not hesitate to ask. Thank you for your enquiry. The epitope recognized by ab2605 maps to a region between residue 575 and the C-terminus (residue 615) of human Multiple Endocrine Neoplasia 1 using the numbering given in entry NP_000235.2 (GeneID 4221). Unfortunately, the exact sequence information is proprietary. I hope this information will still be helpful. If there is anything else that I can help you with, please do not hesitate to contact me. Can you tell me the epitope region for this product? Thank you for your enquiry. The epitope recognized by this product maps to a region between residue 575 and the C-terminus (residue 615) of human Multiple Endocrine Neoplasia 1 using the numbering given in entry NP_000235.2 (GeneID 4221). Unfortunately, the exact sequence information is proprietary. If you would like an alignment done to a certain species, I can have that analyzed. Last month we have bought two menin antibodies. One of them is ab2605, which was created with an immunogen which represents a portion of the C-terminus of the human menin. We would like to know between which aminoacid positions of the menin aminoacid sequence were used to create the immunogen. Thank for your patience. I have received a reply from the originator of ab2605. The epitope recognized by ab2605 maps to a region between residue 575 and the C-terminus (residue 615) of human Multiple Endocrine Neoplasia 1 using the numbering given in entry NP_000235.2 (GeneID 4221). I hope this information helps. Please don't hesitate to contact us again if you have further questions. I am enquiring about your menin antiboday (ab2605). I was wondering want the concentration of the primary antibody was used to get such a clear band and what the secondary antibody was and at what concentration was it used. The mentioned reference in the data sheet does not mention the above antibody. Secondly, were the cell lysates used in the figure overexpressing menin or was it endogenous?